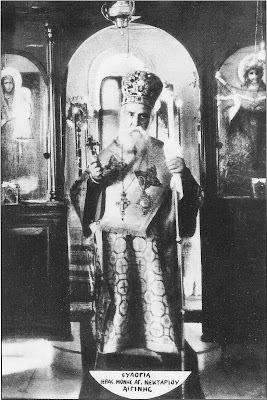 It has been asked why St. Nektarios, a Saint of recent times, works so many miracles today. The answer is because he suffered much in his life, often times being falsely accused by the ignorant. Slander, mocking and false accusation, when endured with humility, patience and trust in God, are a great blessing for the Christian. The humbled are indeed glorified. When St. Nektarios established his female Monastery on the island of Aegina, locals went so far as to accuse him of immorality and that he used the Monastery to perform his debauchery. They speculated that the nuns gave birth to illegitimate children, which they would then throw down the well. One woman from Aegina named Kerou had a grace-filled and God-fearing 16 year old daughter. The mother had a mania to persecute her daughter for this and tried several times to kill her. The young girl took refuge in the Monastery under St. Nektarios. The tender-hearted Saint took her in and protected her. Kerou in turn began to slander the Saint. A Prosecutor received the complaint and the next day came to Aegina angry with two constables. He breached the door, despite the rules of the Convent, and went straight to the apartment of the Saint. The nuns became upset and began to cry. The Holy Bishop got up and received his visitors with his usual Christian smile. Furious, the Prosecutor said to the aged Elder: "You dirty old man, where are the children you are giving birth to? Is that what you are doing here?" He then seized him by his cassock and threatened him, saying: "I'll shave off your beard hair by hair!" The Saint did not say a word. He only pointed his hand above and said: "God sees! God knows!" Indeed, the Prosecutor who was quick to accept slander and dared lift his arm against the Saint became seriously ill within a week. He had terrible pain from his illness. The hand with which he grabbed the Saint dried up. Realizing his error, he felt the need to go to St. Nektarios and ask for his forgiveness. The Saint, out of forbearance and longsuffering, prayed very much for the man. Within two years the Prosecutor's hand had to be cut off. Meanwhile, the Monastery of St. Nektarios prospered and the Sisterhood grew. It has become a spiritual hospital, which gives rest to the soul and illumination to the people of God.